LIEUTENANT GENERAL EUGENE F. TIGHE JR. 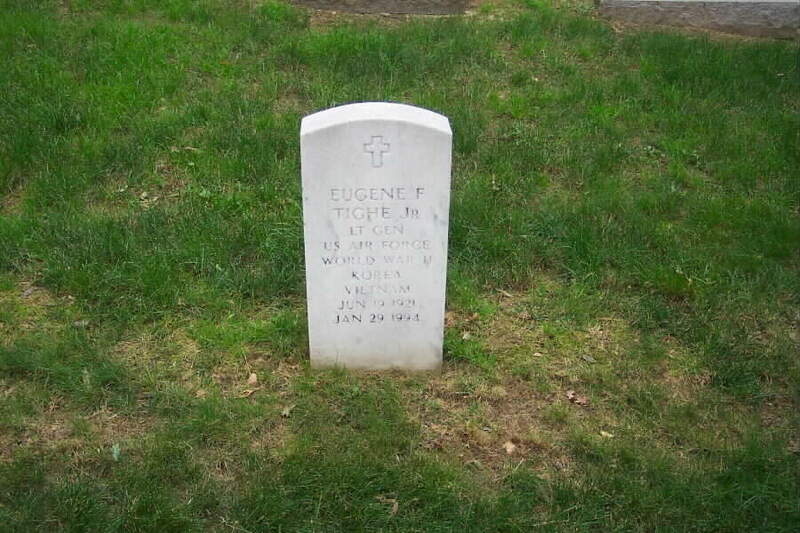 Lieutenant General Eugene F. Tighe Jr. was director of the Defense Intelligence Agency, Washington, D.C.
General Tighe was born in 1921, in New Raymer, Colorado, and graduated from Manual Arts High School, Los Angeles, in 1939. He graduated from Loyola University, Los Angeles, in 1949 as a distinguished graduate, with a bachelor of arts degree in history. The general also completed Air War College at Maxwell Air Force Base, Alabama., in 1966, and received an honorary doctor of military science degree from Norwich University, Northfield, Vermont, in 1980. In September 1942 General Tighe enlisted in the U.S. Army and served at Fort Bliss, Texas; Camp Cooke, California; and in Australia. He graduated from the Artillery Officer Candidate School at Camp Columbia, Australia, in 1944 with a commission as a second lieutenant, and was assigned as an anti-aircraft adviser with the 43rd Bombardment Group, 5th Air Force. He served with the group in New Guinea, Netherlands East Indies, the Philippines and the Ryukyus. In January 1946 he was released from active Army duty and accepted a Reserve commission in the U.S. Army Air Forces. General Tighe entered active duty with the U.S. Air Force in August 1950 as an intelligence officer with the 78th Fighter-Interceptor Group at Hamilton Air Force Base, California. He then served successively from September 1951 to October 1955 as an intelligence officer: one year with the 8th Fighter-Bomber Group at Suwon Air Base, South Korea; two years with the 436th Bombardment Squadron at Carswell Air Force Base, Texas; and one year with the 7th Bombardment Group, also at Carswell. He served with the U.S. Air Forces in Europe at Schierstein, Germany, as operations officer for the 497th Reconnaissance Technical Squadron from October 1955 to August 1958. General Tighe was then assigned to the 544th Aerospace Reconnaissance Technical Wing at Offutt Air Force Base, Neb., where he organized the Research Center of the wing in January 1960, and remained as its chief until June 1965. He attended the Air War College from August 1965 to June 1966. Following graduation General Tighe was assigned as director of targets, Headquarters 7th Air Force at Tan Son Nhut Air Base, Republic of Vietnam. The general transferred to Headquarters U. S. Air Force, Washington, D.C., in August 1967, and served in the Directorate of Operations as special assistant in the Reconnaissance Division until July 1968, and as chief of the Operations Review Division until October 1969. In November 1969 he was assigned as deputy director of estimates, in January 1970 he was named director of estimates, and later served as director of intelligence applications in the Office of Assistant Chief of Staff, Intelligence. General Tighe was deputy chief of staff, intelligence, Pacific Air Forces, Hickam Air Force Base, Hawaii, from August 1971 until April 1972, when he became director for intelligence, Headquarters U.S. Pacific Command at Camp H.M. Smith, Hawaii. From September 1974 to August 1976, he was deputy director of the Defense Intelligence Agency, and served as acting director from December 1975 to May 1976. General Tighe became the deputy chief of staff for intelligence, Headquarters Strategic Air Command at Offutt Air Force Base in August 1976, and served in that position until he was assigned as assistant chief of staff, intelligence, at Air Force headquarters in January 1977. In June 1977 the president appointed General Tighe director of the Defense Intelligence Agency. He assumed his duties in September 1977. During July and August 1977, he served as special assistant to the director of the Defense Intelligence Agency. The general's military decorations and awards include the Distinguished Service Medal with oak leaf cluster, Legion of Merit with three oak leaf clusters, Bronze Star Medal, Meritorious Service Medal, Joint Service Commendation Medal, Air Force Commendation Medal and Republic of Korea Order of National Security Merit (Gugseon Medal). He was promoted to lieutenant general September 1, 1977, with date of rank November 4, 1975. General Tighe's hometown is Los Angeles. 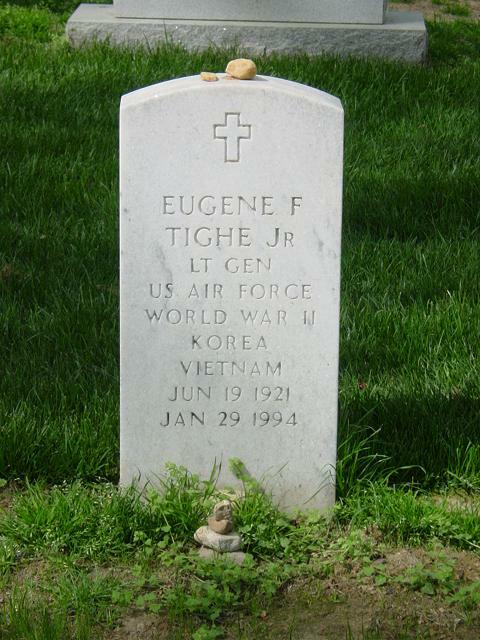 General Tighe was buried in Section 30 Grave 488, Arlington National Cemetery.